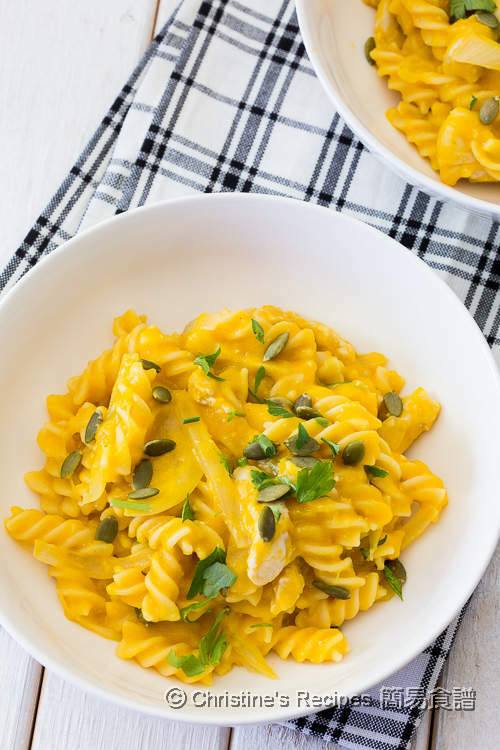 Pumpkin is a versatile food from which we can make many different delicious dishes, pumpkin soup, pumpkin scones, pumpkin bread, pumpkin pie, and even pumpkin cheesecake. The list can go on. I sometimes make pumpkin puree to make sauces. Pumpkin sauce is one of my favourite cooking experiments. It’s very easy to make. Its orange colour and mild sweetness are very attractive. Whipping cream is commonly used for making sauces for pasta dishes. But wait, ever tasted any pasta sauces that made with coconut cream? I tried and made some for my family the other day. 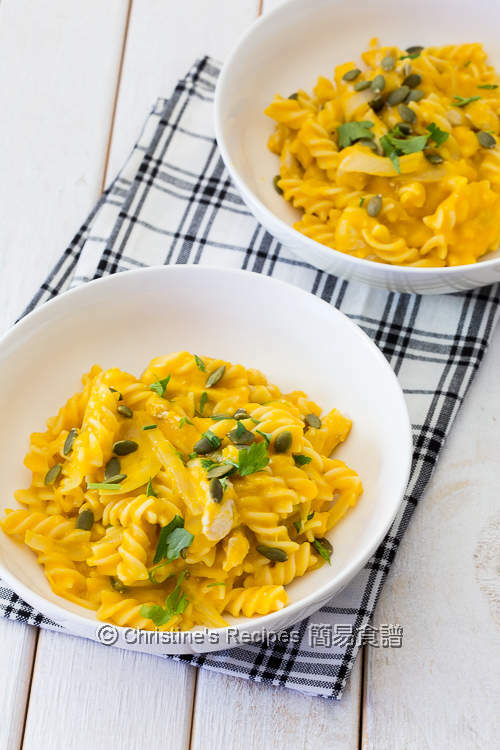 The pumpkin and coconut cream sauce is so creamy, fragrant and tasty. Mix chicken with marinade. Set aside. Heat butter and olive oil over medium-high heat. Saute onion until aromatic. Put onion to the side of pan. Saute garlic in the middle. Stir to combine. Add a little more of oil in the middle. Put in the chicken. Cook until the colour is changed. Add pumpkin puree. Stir to combine. Pour in chicken stock. Bring it to boil. Reduce heat to medium and cook for 3 minutes. Stir in coconut cream. While cooking sauce, cook pasta according to the instructions on packaging, but with 1 minute less. Drain out. 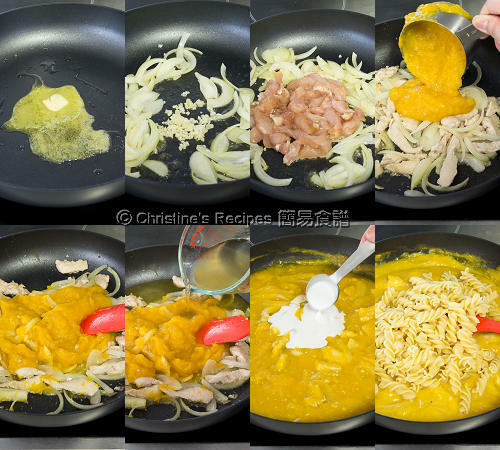 Transfer pasta into pumpkin sauce. Quickly combine all ingredients. Cook for 1 minute. Sprinkle parsley and pepitas for garnish. Serve immediately. Both the taste of coconut cream and pumpkin goes perfect well. You can use cream instead, or simply skip it. I highly recommend to use coconut cream because the taste is so good and make the pumpkin sauce tastes even better. Fresh pumpkin puree is the best and tastes mildly sweet. For convenience, canned pumpkin puree can be used. By adding some olive oil, the butter won’t be burnt easily and keep its aroma. I used Instant Pot to make pumpkin puree. Please click the link to get the recipe if you like. Or you may steam pumpkin until softened on stove, then process into puree instead. Creamy, delicious yet healthy! A perfect Fall meal, Christine.